The word “URGENT” should cost at least $100 per usage. One thing that’s great about platforms is that socially efficient, signal-generating Pigovian taxation like the kind proposed in this tweet is not a joke—you can actually do things like this, which may be one of the great advantages of markets mediated by a powerful third party. This entry was posted in Uncategorized on May 24, 2013 by johnjhorton. UPDATE: Now with embedded code. 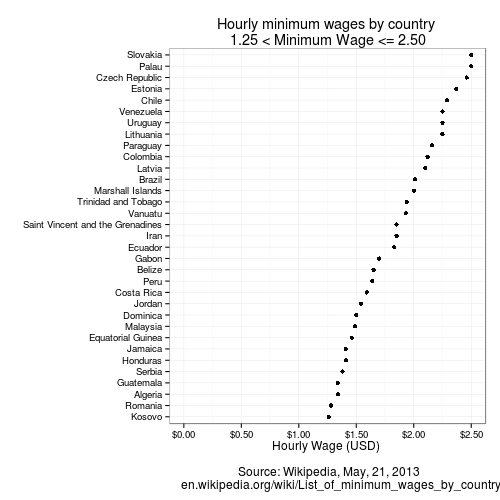 I was looking for some data on minimum wages in various countries and found that Wikipedia (perhaps unsurprisingly) has a very nice, well-annotated table. After downloading the data & cleaning it a bit (harder than it should be), I made several plots. 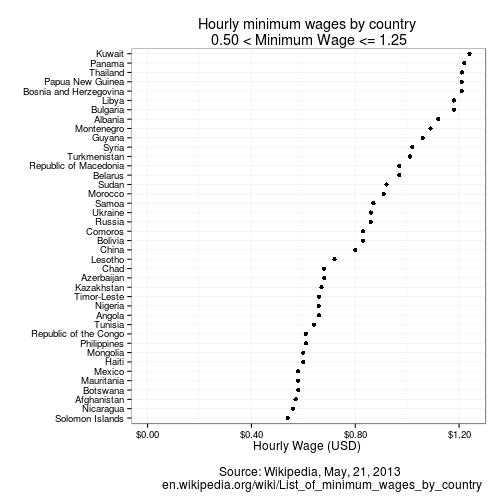 There were too many countries for one plot, so I made one for each (approximate) quartile. 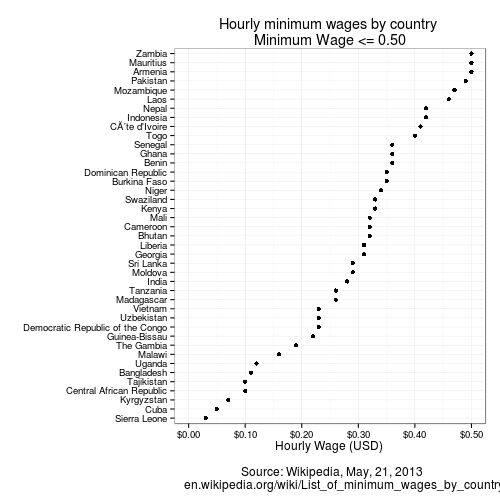 At the end of the blog post is the R code I used for fetching the data & making the plots. 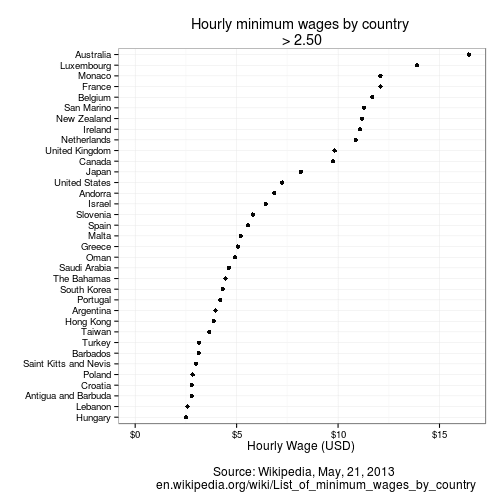 NB: Some countries have exemption policies for worker or occupation characteristics, so for a more complete understanding, of say, why Australia appears to have a minimum wage more than 2x the US minimum wage, check the Wikipedia table. 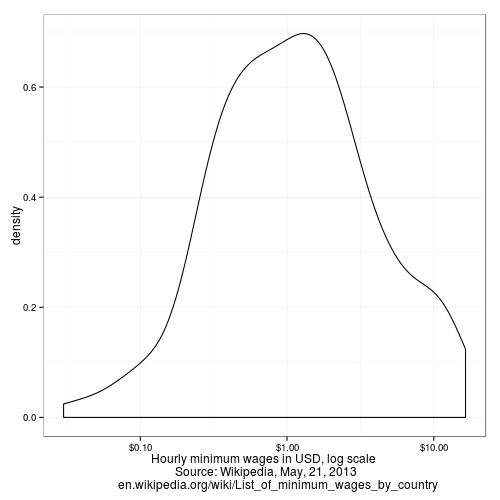 Below is a some R code for grabbing the table of country-specific minimum wages from Wikipedia. This entry was posted in Uncategorized on May 21, 2013 by johnjhorton.